I received an offer for an all-expense paid trip to Germany. However it came with a catch, a big one. It wouldn’t be a vacation, I’d be working. Usually my work travel takes me to less memorable places like the five trips to Philadelphia last year so I appreciated the variety. Still, it’s not like I’d get a chance to see anything other than the inside of office buildings. This write-up won’t be a multi-part series because of that. I’ll cover everything more than adequately in a single article. I only had to show up at Dulles Airport near my residence in the Washington, DC suburbs at the appointed hour. Every other arrangement would be made on my behalf, from transportation to lodging to scheduling. It became a whirlwind trip that included Frankfurt, Ramstein, Wiesbaden and Stuttgart. I managed to visit the German states of Hesse, Rhineland-Palatinate and Baden-Württemberg in the process. The weather cooperated spectacularly. Generally it should be chilly, overcast and damp in November. Obviously we came there to work because "nobody" visits Germany during that time of year, sandwiched so inconveniently between Oktoberfest and the Christmas Markets. Warm, clear skies made it downright comfortable though. What few sights we saw happened outside of work hours and primarily at dinnertime. That’s why most of my photos featured nighttime scenery. 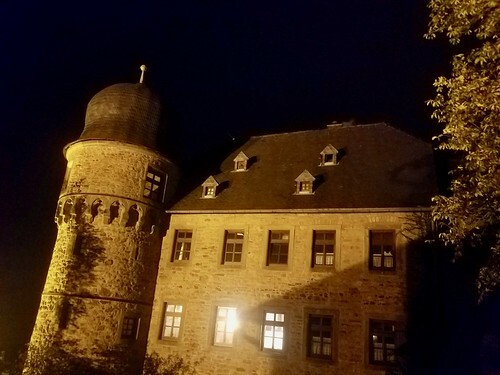 One evening our Germany-based staff took us to dinner at Burg Lichtenberg, a restaurant in the remnants of a 12th Century castle (map). We ate well throughout the week, sampling typical German fare like schnitzel and wurst along with mounds of potatoes and spaetzle. I didn’t see a whole lot of vegetables. I craved greens by the end of the trip and ate a giant salad as soon as I got home. I had no control over the schedule although our local crew did take us to a brewpub for lunch one day. 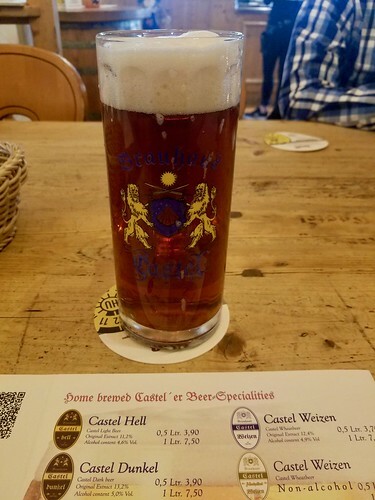 We stopped at Brauhaus Castel in Wiesbaden (map). That choice earned my immediate praise and admiration. I also did as the Germans do and had a beer with lunch. I simply couldn’t go to a brewpub and not have a beer! While beer sampling certainly didn’t factor in as a focus of this trip, I did try to taste a variety of styles at meals throughout the week. And why shouldn’t I, with beer literally cheaper than (bottled) water? I looked forward to experiencing the unlimited speeds of the Autobahn although those finely engineered German highways didn’t always return the love. They taunted me instead. 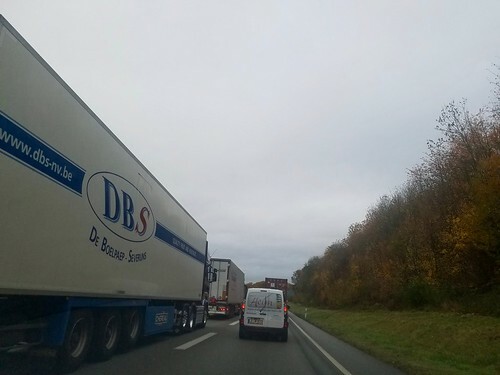 We saw plenty of traffic and tail lights on the stretch between Frankfurt and Stuttgart. Certainly, we could go as fast as we liked… as long as we liked going 40 kilometres per hour. That gave me plenty of time to notice the other cars around us. I learned that the initial alphanumeric character(s) of German license plates represented the registration city. So, for example, a plate beginning with an F came from Frankfurt, an S from Stuttgart, and so on. Also it indicated the relative size of the city because only the largest places got a single letter. Smaller places were assigned two or even three letters. The hotel we stayed at in Frankfurt (map) had a couple of interesting features. Most noticeably, I saw the world’s strangest elevator in the lobby to the right of the reception desk. It ran on a continuous loop with open compartments and passengers could hop on or off at will. People never had to wait more than a few seconds for a ride. The downside might be, well, the possibility of decapitation with poor timing. I could never imagine this contraption being allowed in the United States with its strong liability laws. Frankly, it scared me. 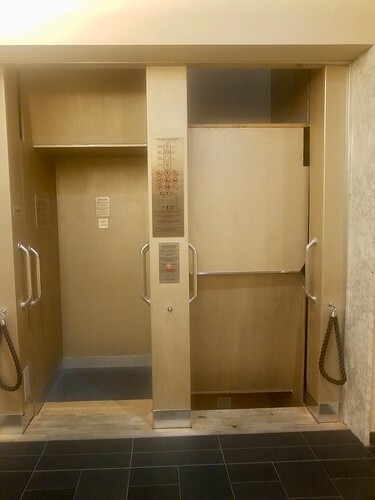 …a passenger elevator which consists of a chain of open compartments (each usually designed for two persons) that move slowly in a loop up and down inside a building without stopping. Passengers can step on or off at any floor they like. The animation on Wikipedia showed it best. I brought my luggage to the room on the regular elevator, thank you very much. However I summoned a little courage later on and rode the paternoster as I waited in the lobby before heading out to dinner with our group. Mostly I wanted to see what happened when it reached the end of the line. It simply looped around with nothing to stare at but a cinder block wall, although an elevator moving horizontally even briefly felt rather disconcerting. I’ve traveled outside of the United States extensively so I’ve developed a level of comfort with the metric system. However, I experienced something new this time, my first run on metric treadmill in the hotels where we stayed. For context, understand that I hate treadmills and I will only use one when I simply can’t get outside. The only thing that makes one bearable is that I pretend I’m running one of my regular outdoor routes in my mind. I overlay mileage in my head with the imaginary route as a way to avoid tedium and boredom. I’d made the necessary mathematical calculations beforehand to make sure I got the pace right and I then had to make conversions on-the-fly to estimate progressive mileage. So I got both a mental and a physical workout. 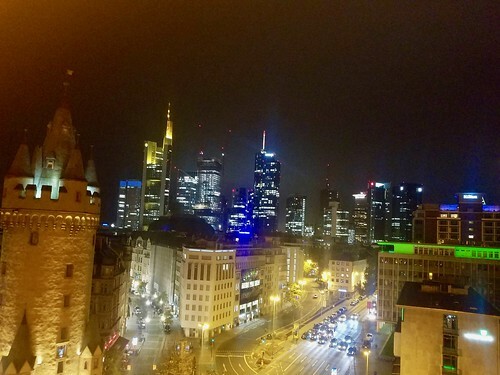 We may not have gotten out much during the day although we did enjoy the views of Frankfurt from the hotel terrace.